Painting by Linda Kaiser, of Florence Gardens 30 miles from the noise, traffic and congestion of big city life, residents of Florence Gardens enjoy - warm winters - clean air and all the of 55+ golf course retirement. View area Enhanced Photo Tours. Never pay rent again. You own the land your new home is on! Choose a home along a fairway or on a view lot overlooking beautiful desert mountains. Florence Gardens offers the best in active retirement living. Choose a lot right on the nine hole golf course, or select a terraced lot overlooking the historic town of Florence. There is a 15,000 square foot Clubhouse which offers meeting rooms, billiards, swimming, barbecue, picnic areas and much more! Come see the three different lifestyles. Click here to view a large map of the Florence Gardens area. Click on Florence or here, to view location map. Your new manufactured home will be set-up just the way you want it. We can provide a two car garage, air conditioned workshop, almost anything you need to make your house a home. 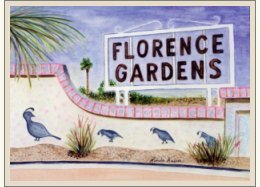 Whether you are looking for a winter residence or a full-time retirement home, Florence Gardens is waiting for you.